Back in 2013, three Muslim converts and associates of hate preacher Anjem Choudary caused outrage when online videos came to light showing them trying to enforce sharia law on British streets. The group calling themselves the ‘Muslim patrol‘ were seen harrasing and threatening innocent non-Muslims minding their own business . 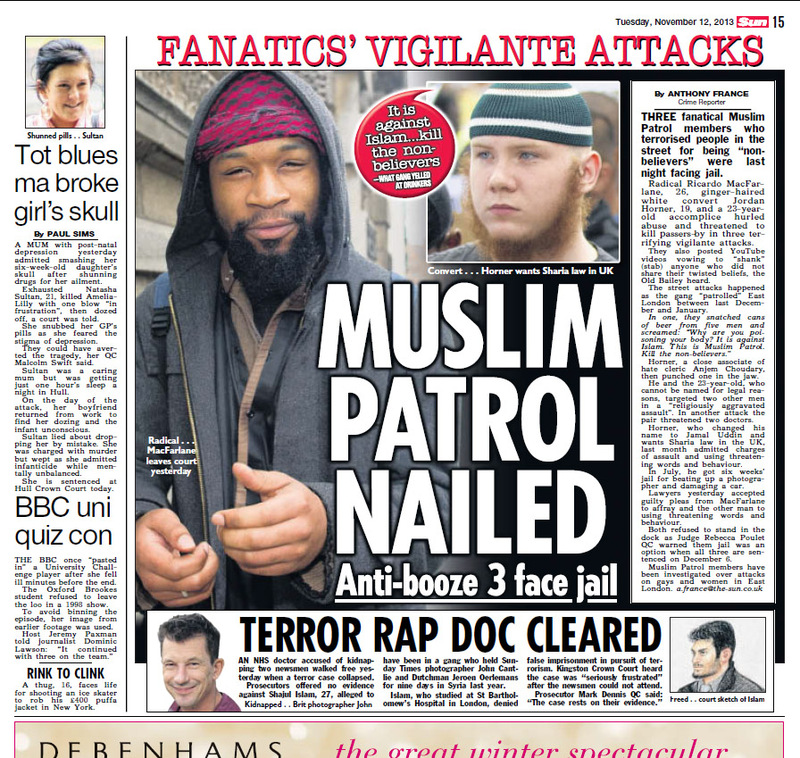 The 3 extremist Muslim Patrol members were Jordan Horner, Royal Barnes, and one Ricardo McFarlane. Well despite the ASBO and the threat of being recalled to prison, it appears fundamentalist Ricardo McFarlane is back up to his old tricks. Ignoring the court order and setting up dawah stalls in various locations of London to try and spread his extreme version of political Islam. A Muslim convert is accused of breaking an Asbo by touring London preaching Sharia Law to members of the public, a court heard. Ricardo McFarlane, 29, allegedly set up street stalls and handed out leaflets to passersby arguing the virtues of Islamic rule. It is claimed he was breaking an anti-social behaviour order banning him from promoting Sharia Law in public and making unsolicited approaches to members of the public on the subject. McFarlane appeared at Westminster magistrates court on Tuesday accused of four breaches of the Asbo and one charge of possession of fake Spanish ID document.Wearing a dark coloured traditional Islamic robe and a green and black head scarf, McFarlane pleaded not guilty to all charges and insisted on standing up throughout the hearing. It is said he first set up stall in Enfield Town on March 24 where he allegedly “distributed unsolicited material and made unsolicited approaches to members of the public in order to promote Sharia Law”.McFarlane was allegedly outside TopShop in Oxford Street the following day with a similar stall, and is said to have gone to Tooting Broadway Station on April 4 and Kingsland Road in Dalston on April 16. He allegedly handed out leaflets promoting Sharia Law to the public during all the demonstrations, and is accused of “causing harassment alarm and distress”.McFarlane, of no fixed address, was remanded in custody until a hearing at Southwark crown court on December 27. Sharia is against God’s law. Islamists are against God’s people the Israelites. How can Sharia be God’s law? Muslims lie. Muslims want to destroy the temple of God. The body is a temple for the Holy spirit. People promoting Sharia a need to be killed on the spot sending them to Satan’s prison where their beloved Sharia is practiced on lost souls.